Absolutely love these bar stools and they look great in our outside bar area!! The shipping was so fast and the packaging of each chair, just unbelievable!!!! Very happy with our purchase and the great care Panama Jack has for their outdoor furniture!! Enjoy the best of outdoor living with high quality furniture from The Island Cove collection by Panama Jack. This collection was developed from the Island Breeze Sling group. The addition of an exclusive woven synthetic wicker called Viro was chosen by Panama Jack to use for the Island Cove, eliminating the need for cushions. The Swivel Barstool incorporates a tubular extruded aluminum frame in a unique baked on powder-coated espresso finish that will not rust. 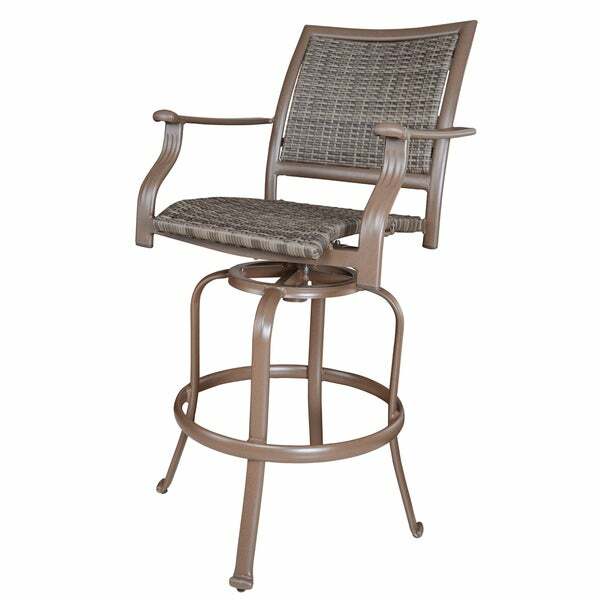 This barstool features a swivel base that gives you the freedom to enjoy the fun from all angles. "What is the actual color of this stool ? One ID says grey/brown and one says grey. Looks more like bronze. Thank you !" The finish is a mixture of brown and grey. "What is the height from floor to seat?" Unfortunately, this item is currently out of stock. We do not have inventory to check. Please enter your email address on the product page and we will notify you if it comes back in stock.